The relationship between Silicon Valley and the Pentagon is one of the most high-stakes, high-tension, and high-dollar links in the world. Desperate to lead the globe’s militaries in artificial intelligence, the U.S. Defense Department is trying to navigate a maze of tech employee protests and political minefields with the hope of getting cozier with American technology giants. Google executives will meet next week with U.S. General Joseph Dunford, the chairman of the Joint Chiefs of Staff and the nation’s top general, to discuss Google’s artificial intelligence business in China and the company’s troubled relationship with the Pentagon, Dunford revealed on Thursday during a live interview at the Atlantic Council in Washington, D.C.
Dunford has said Google’s business is helping China catch up militarily to the United States. The labyrinthine and opaque relationship between private companies and China’s government complicates any effort to understand exactly how Beijing impacts or benefits from each firm. Dunford hasn’t offered any proof or even much in the way of details for his accusations. Instead, he’s joined a chorus of politicians increasingly hostile to the company after Google’s 2018 pledge to not develop AI weapons technology, a pledge that first and foremost impacts the Pentagon. The complicated and at times cold relationship between the Pentagon and Google has put a spotlight on how the Defense Department and Silicon Valley do—and at times do not—do business. Last year, in the most high-profile split yet, protesting Google employees moved the company to drop Project Maven, a drone AI imaging program. Google’s work on Project Maven was first made public by Gizmodo in March 2018. Google isn’t the only American tech giant working on AI in China. Both Microsoft and Amazon have AI centers in China. The difference, it seems, is that both Microsoft and Amazon have never had a high-profile split from the Pentagon and have no pledge comparable to Google’s. Microsoft CEO Satya Nadella, for example, defended the company’s Pentagon business in the face of employee protests. 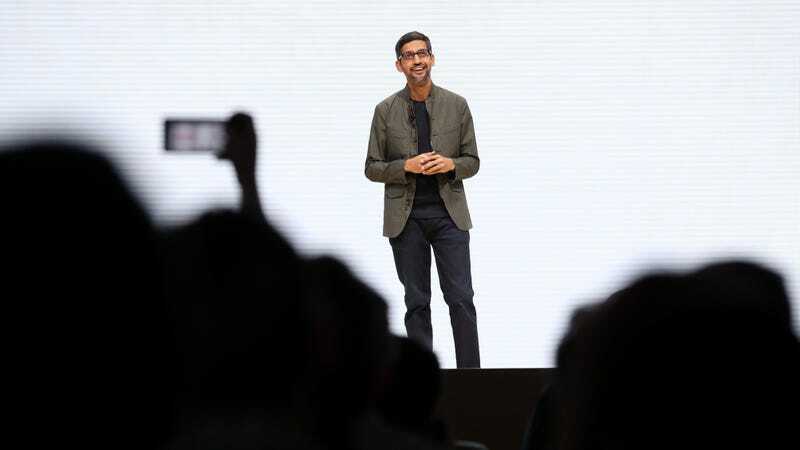 Google continues to work with the U.S. government, including the Pentagon, on AI projects, according to a Google spokesperson. The chief difference now is that the projects don’t involve developing AI weapons technology, a core focus of the Defense Department’s AI push. Last week, Dunford testified to the Senate Armed Services Committee that Google’s AI business in China provided a “direct benefit” to the Chinese military. President Donald Trump tweeted much the same criticism last week, except he managed to make it about himself. Dunford insisted that the debate he was talking about extended far beyond Google to the whole of Silicon Valley and any American technology company doing business in China. Pointing to China’s ongoing brutal crackdown and surveillance of the Uighur minority, the American general argued that artificial intelligence and cutting edge technology, in general, is leveraged by the Chinese Communist Party to exert dominance and repression over much the country. Google offered a small push back last week when a spokesperson argued the company isn’t working with the Chinese military. When reached for questions by Gizmodo on Friday, Google did not offer confirmation of the upcoming meeting or details about who would attend. Last week, the company also said it was working directly with the Pentagon on areas including cybersecurity, recruiting and healthcare. Pentagon funding for artificial intelligence will double in an upcoming budget proposal, Shanahan said. The Pentagon’s recently established Joint Artificial Intelligence Center is slated to increase from $89 million in 2019 to $414 million in 2020, according to Pentagon budget requests. Google’s ambitions in China are no secret, although maybe they’d like them to be. The company experienced a loud backlash when early plans to build a censored search engine in China were leaked. The company then pledged to abandon the Chinese search project. Google’s business in China has been limited since 2014 when the company pulled out most products from the country in a fight over censorship. Google’s Android operating system remains the most popular mobile operating system in the world, including in China. If you know the inner workings of the relationship between Silicon Valley and the Pentagon, Gizmodo would like to know: Email poneill@gizmodo.com or message him on Signal at 1-650-488-7247.